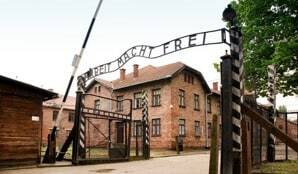 Isabel Thomas and Owen Topham in Year 12 visited Poland with the Holocaust Educational Trust to visit Auschwitz as part of the ‘Lessons from Auschwitz Project’ to educate the young people of Wales about the Holocaust. To begin the lessons, we went to an orientation seminar in Cardiff. Here, we met with 150 other students from across Wales that would be participating in the project. At this seminar, we learnt about pre-war Jewish life with particular focus on how spread out Jewish families were over Europe as well as the different types of Jew in Europe. We also had the honour of listening to the personal testimony of Eva Clarke, the baby born in a concentration camp. Eva was born in Mauthausen concentration camp, Austria, on 29th April 1945. She and her mother are the only survivors of their family, 15 members of whom were killed in Auschwitz-Birkenau: three of Eva’s grandparents, her father, uncles, aunts and her 7-year old cousin. This was a once in a lifetime experience, it made all the teaching and learning we had received feel real. Little did we know but this wouldn’t be the last time we felt like this. Then, on the 20th of February, after a very early airport check-in at Cardiff, we flew out to Poland. Altogether, the travelling took 4 and a half hours to reach our first destination. We first visited a town called Oświęcim. Here, we explored again pre-war Jewish life and learnt how Jews owned many of the grand buildings and held a market in the square every week. It was an eerie feeling knowing they no longer owned the place like they had. We then made our way to the first camp, Auschwitz 1. Our group met with our tour-guide and then we entered the ‘museum’. The tour started with walking through the infamous “Work Will Set You Free” gate where the guide described the Jews first impressions and experiences on arriving at the camp. After heading into the camp, the group then began a tour of the red-brick blocks, talking about the history of each building and what the Jews experienced in each. In these blocks were displays of Jewish possessions before they were taken from them: human hair, shoes, glasses, pots and more. When walking through each block the pictures of prisoners were on the wall, sometimes there would be full families and sadly, most of these people had been killed. We then walked to the main courtyard where many innocent Jews were executed by firing squad simply because of their religion. A few days before we visited as a group, the Vice-President of America and the President of Poland had donated memorial wreaths in memory of the innocent lives that were lost. To end the experience of Auschwitz 1, the guide took us to the infamous gas chamber and crematorium here. Whilst walking through, it took us by surprise the size of the chamber. It felt extremely horrifying, knowing that people had taken their last breaths here and this would have been their last view of this world. After a short drive to the second camp, Auschwitz Birkenau, we first walked to the famous tracks. These were the tracks that took 1.1 million people to their death. Standing in front of the famous red-brick entrance was eerie. Knowing that the cattle trucks carried people to the end of their lives was horrific. After walking through the entrance, it hit us how expansive the place was. Both of us had never thought that the place would be so vast, and it really showed how the Nazis didn’t do much to cover up their death factory. The cold also got to us (despite being wrapped up in many layers) and this put into perspective how cold the prisoners would’ve been in only their thin, single layer – often just striped pyjamas. We then visited the barracks. These were extremely cramped and many people would’ve died here from the many illnesses that were spread. We were also shown the toilets and how they were all next to each other. It showed us how horrific conditions would’ve been and the prisoners were only allowed to go to the toilet twice a day – morning and evening. Throughout this camp, we read survivors’ accounts and this really helped us to understand how inhumane the place was. We were absolutely shocked at how easy the killers selected their victims. It disgusted us. We visited the remains of the gas chambers where the Nazis had attempted to cover up their tracks. I think this part really hit our group hard as we saw the place that over a million people lost their lives. The fact that we were stood there, and that we could easily leave where these people had no choice but continue to their deaths silenced us. We really did not know what to think. As darkness fell we eventually finished our tour of this horrifying place. We ended up in a building filled with the pictures that the prisoners brought to the camps. However, they would never see these again. We spent some time looking around the walls. In this building, we also attended a ceremony by Rabbi Marcus. He preached to us about how we must never let this man-made disaster happen again. It was a very effective ceremony and extremely moving. Before making it back to the bus, we lit candles in memory for all the innocent victims that pointlessly lost their lives here. We then left the camp, feeling slightly guilty that we could do so when so many never did. The flight home was filled with discussion and sharing our thoughts with the other schools. All of us agreed at how shocking the place was. The post-visit seminar was held in Cardiff again. Here, we spoke about our experiences and how we all felt. This was great as we could see how the rest of our group felt. We all couldn’t believe how big the place was. We were then advised on how to ensure that this would never happen again and how we need to spread the word. The survivors are unfortunately passing away due to their age and that’s why we have written this. We want you, the reader, to know how over 6 million people were killed due to their religion, sexuality, disability or political views. These reasons are pointless. So please, remember this disaster, learn to get over your small quarrels, and know how lucky you are to have your life and your family. It took us both a few days to really comprehend what we had just experienced. Of course, we were both extremely humbled to be given the opportunity to visit this place but at the same time it was hard to believe how humans could do this to other humans. Warner Bros. Harry Potter Experience and what an experience it turned out to be!